MacerSoft is an effective software development company, Welcome to world of web application Solutions . We have Professional team having expertise in different web technology for web 2.0 including .NET, JAVA, PHP etc.., Including Web Design in HTML5. We provide affordable and quality services to various clients across the Globe. Functional and highly serviceable applications that match your business needs, requirements and expectations. Smart and unbolt application architecture allow high productivity and scalability. Application maintainability that reduce the total cost of software. Completely organized and transparent development process backed with flawless communication. 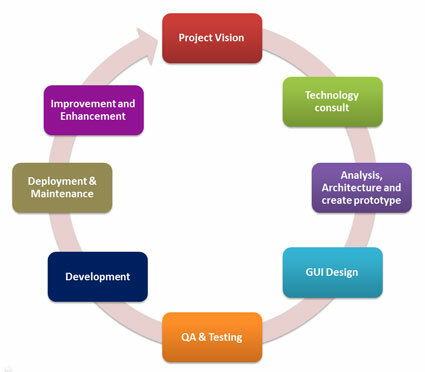 Smart QA process throughout the software development life cycle. Deployment and ongoing support & maintenance on and after delivered application. We commit a long-term partnership to customer is apply in complete development cycle, services wrapper apply on software production and implementation. We offer complete transparent activities and deliverables, project management, and flawless communication. Technology consult If we provide suggestion and giddiness to choose technology based on business requirement and future aspect, and if you have any technology preferences we have provide technical team that work with you on selected technology. Analysis, Architecture and create prototype from the first stages we carry out functional analysis, business process and data flow design to create the scalable architecture that provide high application performance, scalability and extensibility. QA & Testing our QA and testing processes are standards and practices, supported with advanced testing tools to guarantee the highest quality application delivery. QA Experts start to work from Analysis phase to End of Cycle that reduces Development and maintenance cycle. Development is continuous, and transparent throughout SDLC that gives better control and visibility into the process. Combined with best development methodologies and techniques with significant management tools deliver end-to-end web solutions. Deployment & Maintenance As soon as development finish deployment carried out on QA / Staging/ Production server based on Plan. Provide complete support on / after application hosted on to production server. We offer remedial, adaptive and scheduled maintenance. Improvement and Enhancement We work to enhance software by adding new feature or enhancing current based on market change without interrupting current ongoing System. MacerSoft Understand importance of your business, hence we come across solution for your website. MacerSoft Offer you to build a ‘Responsive Design Website” using Word press as well as programmatically by using HTM5 and latest technology. MacerSoft help to get targeted traffic and a huge ROI by doing SEO, compared to any other online marketing or advertisement technique. Search engine optimization (SEO) is the process of improving the volume and quality of traffic to a web site from search engines via “natural” (“organic” or “algorithmic”) search results. Recent scenario of smart phone users and development of latest technology indicates that demand of mobile app development is increasing rapidly. MacerSoft is having more experience in , we offers mobile application development services for android, iPhone, iPad and windows mobile application development. Signup for our Newsletter and get attractive offers and information.